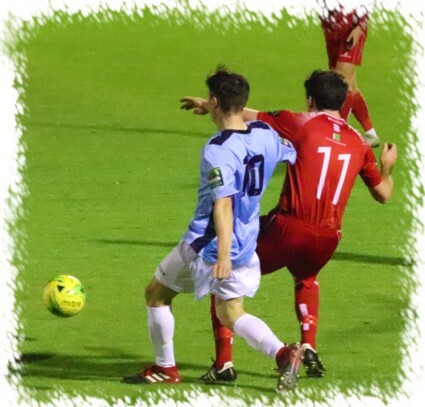 Hayes & Yeading moved up to second place in the table with a comprehensive drubbing of local rivals Uxbridge at the SKYex on Tuesday evening. Manager Paul Hughes made a single enforced change to his starting line-up as Toby Little missed out through injury and was replaced by Josh Chamberlain in the left wing-back slot. It took just three minutes for United to get on the scoresheet as a long clearance was headed to Scott Donnelly by Hassan Jalloh, the skippers throughball to Lee Barney saw Reds defender Cory Watson slip which provided Barney with time to draw ‘keeper Paul McCarthy before firing home past the grounded stopper. On 11 minutes the visitors Zaine Gangedeen played a nice ball through the middle of the United defence for Tyrone Pink to chase but the ever alert Jack Smith was quickly to the edge of his box to fire the ball clear before the Reds winger could get to it. A neat move from the back minutes later saw United double their advantage, Roddy Collins intercepted on the edge of his own box and fed Scott Bridges who instantly found Barney, he in turn slid the ball to his right to Jalloh still inside the United half, the United man moving forwards without challenge until reaching the edge of the Uxbridge box where he turned Jean-Paul Antwi before firing low past McCarthy. The lead moved up another notch a couple of minutes later as Jalloh fired the ball across to an unmarked Chamberlain who controlled the ball and rolled it to Donnelly just outside the “D” and he drove it first time past McCarthy into the top corner of the Uxbridge net. A nineteenth minute Kevin Warner snapshot gave Smith catching practice with the next opening falling to United as Bridges rolled a short free-kick to the on-coming Donnelly who saw his first time drive palmed away by McCarthy. A pair of corners around the 25 minute mark resulted in a Jalloh shot that whistled wide of the far post and ten minutes later a Bridges effort from distance was easily dealt with by McCarthy. Towards the break a stray pass at the back sent Matthew Woods away at the United goal, any chance of a shot being snuffed out by a combination of Ed Asafu-Adjaye and Liam McDevitt on the edge of the United box. Then as we approached the break, Tom Jelley won possession on the right side, skipped past a tackle before finding Donnelly whose aim was a tad off this time and his effort just missed the top corner. Then in stoppage time United added number four when Asafu-Adjaye’s shot was charged down, he reclaimed possession and found Chamberlain on the left just outside the box, his low centre found Barney six yards out, his shot on the turn forcing an excellent one handed save from McCarthy who was helpless as Jalloh collected the loose ball and fired home his second of the game. Paul Hughes made an attacking change at the start of the second half with striker Duncan Culley coming on for defender Liam McDevitt. The first chance of the half not surprisingly fell to the home side, Jalloh’s neat chipped cross from the left being met by the head of Barney only for McCarthy to tip over his goalbound effort. The resultant short corner saw a quick exchange between Jelley and Chamberlain, the latter’s in-swinging cross being glanced goalwards by Roddy Collins only for his effort to come back off the post to Jalloh who worked a shot from the corner of the box that McCarthy pushed away with his defence clearing the ball upfield. Next to try his luck was Culley, the striker expertly bringing down Asafu-Adjaye’s long ball in the left channel before hitting an angled shot that McCarthy pushed wide. 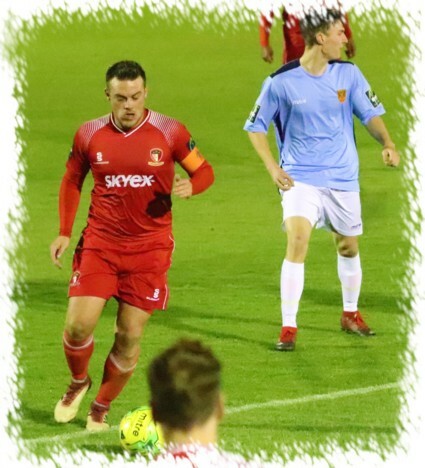 Just before the hour mark, a poorly struck Smith goal-kick went straight to former United man Matt Sinclair, the situation being recovered by the alert Asafu-Adjaye whose tackle prevented a shot on the United goal. Goal five was not long in coming however as Jalloh surged forwards, his shot was deflected to the right where Barney pounced on it to fire past McCarthy from an angle to bag his sixteenth of the campaign. Just as we arrived at the final fifteen minutes and with the visitors hsowing no real hint of troubling Jack Smith, a quick ball upfield to Culley saw the striker get to the ball before McCarthy only for his volley to go inches wide of the post. This was followed minutes later by Barney receiving the ball on the right corner of the Reds box, his driven shot being tipped over by McCarthy to deny him another hat-trick. 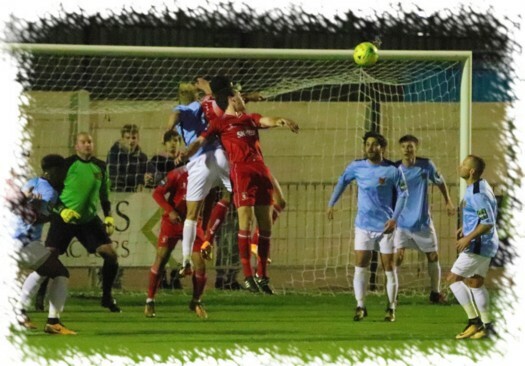 Four minutes from time Smith was finally required again but once more in no major way as Sinclair’s chipped cross fell to former Hayes FC favourite Kevin Warner, his volley being comfortably dealt with by the United ‘keeper. In stoppage time, United substitute Keano Robinson intercepted a Crossfield free-kick and raced up the field, his shot from the edge of the area being pushed away by McCarthy and with no further incident the game came to its conclusion with United scoring a big victory over our local rivals leaving a home league record of played 5, won 5, scored 25 conceded 1. United Man of the Match: Scott Donnelly.